Sta. 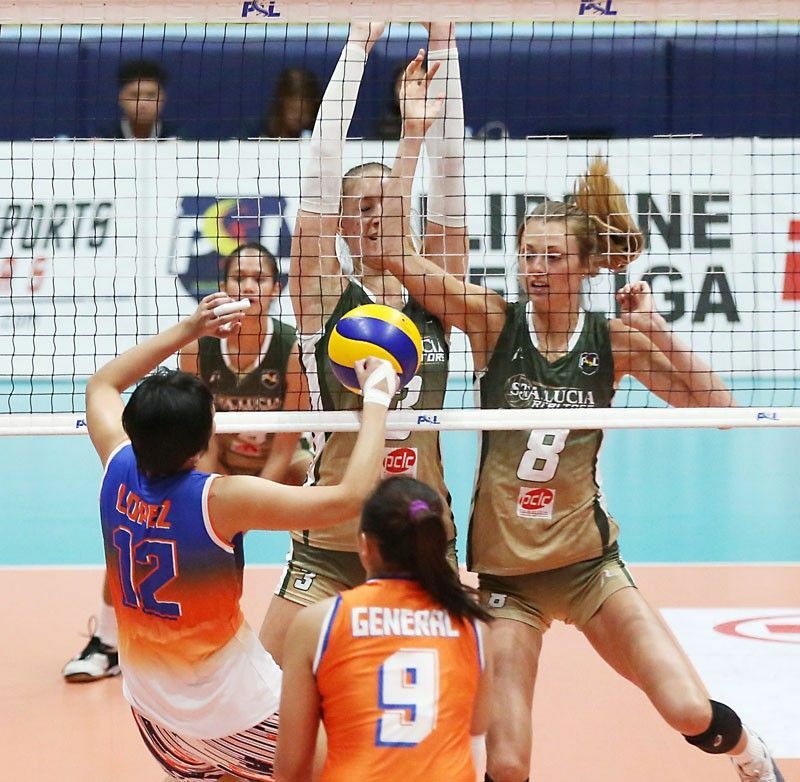 Lucia imports Molly Mohman (8) and Casey Schoenlein impose their height against against Generika-Ayala locals Mikaela Lopez (left) and Bia Fatima General in their Superliga GP game Saturday at the Caloocan Sports Complex. Generika-Ayala won, 25- 20, 25-20, 21-25, 25-18. MANILA, Philippines — Holder Petron seeks to continue on its path of destruction as it guns for its 12th straight victory today versus streaking Generika-Ayala in the Philippine Superliga Grand Prix at the Filoil Flying V Center. The Blaze Spikers have shown their hot-form in a straight-set demolition of rival F2 Logistics last Saturday and coach Shaq delos Santos wants his wards to maintain their winning attitude in the 2 p.m. duel with a Lifesavers team (4-7) riding on a three-run roll. With power import Kath Bell and Steph Niemer and star-studded locals led by Aiza Pontillas, Rhea Dimaculangan, Mika Reyes and Denden Lazaro bannering Petron, Generika Ayala’s crew of of Kanjana Kuthaisong, Kseniya Kocygit, Angeli Araneta, and Fiola Ceballos expect to have their hands full in keeping their run and giant-slaying spree. “We’re prepared for them. We’ll see what happens,” said Lifesavers coach Sherwin Meneses. In the other matches, PLDT Home Fibr (7-5) battles Cignal (6-6) at 4:15 p.m. and United VC (5-5) faces slumping Foton (1-9) at 7 p.m. seeking to boost their respective bids for twice-to-beat advantage in the quarterfinals. Meanwhile, F2 Logistics called back Venezuelan import Maria Jose Perez, the 2017 GP MVP, to step up its title bid. Perez replaced Becky Perry and looks to form a formidable tandem with Lindsay Stalzer, the 2018 GP MVP, for the team that’s currently beset with injuries to Cha Behag, Kim Fajardo and Kianna Dy.